There are a lot of different resources that you can find and they can be used for a plethora of different stuff. Mainly, they are used for upgrading the armor of Kratos and enhancing his combat stats so that he can be more effective when in battle. The resources are vast in number and thus, this God of War Materials Locations Guide is essential when trying to find them. Our God of War Materials Locations will tell you all about the different materials that are available to you in God of War 4 and will guide you on where to easily find them. The materials in God of War will be used to upgrade bits and pieces for your armor. 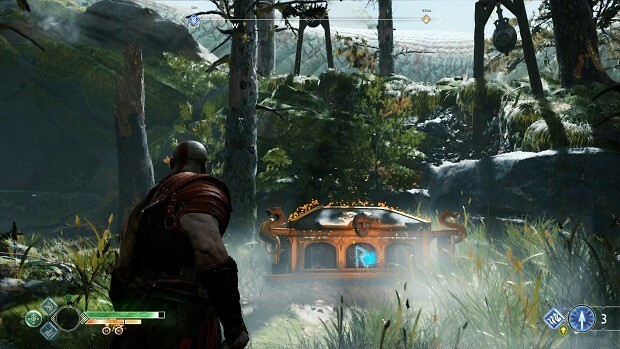 You will need to use them to craft new pieces and make Kratos stronger as you will probably not be able to deal with some of the better monsters that come in the later stages of the game without these upgrades. These upgrades can be found all over the world, and thus, it is good to have a manual which can effectively guide you in securing whatever it is that you need with ease. With the help of our God of War Materials Locations Guide, you will be able to locate all the different Crafting Materials used in God of War 4 Crafting. Here are all of the materials that you can find in God of War 4. Aegir’s Gold Find it in Lake of Nine. Used to upgrade armour and buy Runic Attacks. Soft Svartalfheim Steel Find it on large enemies and in coffins. Used to upgrade armour and Talon Bow. Solid Svartalfheim Steel Find it on large enemies and in coffins. Used to upgrade armour and Talon Bow. Hardened Svartalfheim Steel Find it on large enemies and in coffins. Used to upgrade armour and Talon Bow. WorldSerpent Scale Fragment Loot it around Lake of Nine on enemies and chests. Used to craft common Pommels. WorldSerpent Scale Loot it around Lake of Nine on enemies and chests. Used to craft rare Pommels. Dust of Realms Find it near Realm Tearsto. Used do upgrade Talismans. Pure Essence of Realms Found in certain Realm Tears. Used to upgrade powerful Talismans. Frozen Flame Acquired by completing certain tasks. Used to upgrade Leviathan Axe. Chaos Flame Acquired by completing certain tasks. Used to upgrade Blades of Chaos. Leiptr Alloy Get from defeating Magni and Modi, also from Treasure Maps. Used to upgrade the axe Pommel: Grip of Tanngiost. Eternal Frost Reward for a Treasure Map. Used to upgrade the axe Pommel: Ymir’s Breath. Unyielding Cinders Reward for a Treasure Map. Used to upgrade the Blades Pommels: Explosive Grips of Fire. Unstable Ore Reward for a Treasure Map. Used to upgrade the Grips of the Cursed Flame. Oblivion Stone Find it in chests near Konunsgard Stronghold. Used to upgrade the axe Pommel: Hræzla Farmaðr’s Grip. Dragon Tear Release three Worlddragons. Used to upgrade two Epic Talismans. Corrupted Remnant Complete the ‘Unfinished Business’ favour. Used to upgrade the axe Pommel: Versatile Warrior’s Handle. Glacial Catalyst Find it in Treasure Maps. Used to upgrade the Epic talisman, The Charm of Infinite Storms. Pristine Dust of the Realm Find it at Stone Falls. Used to upgrade powerful armor. Pristine Ore of the Realm Find it at Iron Cove. Used to upgrade powerful armor. Pristine Scales of the Realm Find it at Light Elf Outpost. Used to upgrade powerful armor. Traveler’s Grisly Trophy Loot travellers. Used to craft and upgrade the Traveler armour. Traveler’s Armor Shard Loot travellers. Used to craft and upgrade the Traveler armour. Ancient’s Rubble Loot Ancients. Used to craft and upgrade the Ancient armour set. Ancient’s Heart Loot Ancients. Used to craft and upgrade the Ancient Armour Set. Offering to Týr Complete the Favors: “Anatomy of Hope,” “Dead Freight,” and “Hammer Fall.” Get them to a shop. Dragon’s Fury Complete the favour, “Hail to the King.” Use them at a shop. Screams of the Innocent Complete the favour, “Hail to the King.” Use them at a shop. Ultimate Sacrifice Complete the favour, “Hail to the King.” Use them at a shop. Smoldering Ember Finish MuspelheimTrials, then loot chests in the area. Used to upgrade Muspelheimarmor, Talismans and Pommels. Crest of Flame Complete impossible trials in Muspelheim. Used to upgrade Muspelheimequipment. Greater Crest of Flame Get a Silver or Gold on Impossible Trial #6 in Muspelheim. Used to upgrade Muspelheimequipment. Crest of Surtr Get a Gold on Impossible #6 Trial in Muspelheim. Used to upgrade Muspelheimequipment. Rusted Royal Armor Found in the favour, “Ivaldi’s Protection.” Use them at Sindri’s shop. Mist Echoes Found in chests in Niflheim. Main resource when craftingand upgrading Niflheimarmor, Pommels, and Talisman. NiflheimAlloy Fragment Found in Legendary chests in Niflheim. Used to craft Niflheim armour. Haze Weave Found in Legendary chests in Niflheim. Used to upgrade Niflheim armour. Aesirbane Found in Legendary chests in Niflheim. Used to upgrade Niflheim armour further. Leiptr Alloy Loot a Valkyrie. Used to upgrade Valkyrie armour, talismans and pommels. Perfect Asgardian Steel Loot a high-level Valkyrie. Used to further upgrade Valkyrie armour, talismans and pommels. Iðunn Apple Loot Nornir Chests. Find three to get maximum health. Horn of Blood Mead Loot Nornir Chests. Find three to get maximum rage. 10 Aegir’s Gold 500 Hacksilver Sindri. 100 Aegir’s Gold 5000 Hacksilver Post second drop of water. 1 Soft Svartalfheim Steel 250 Hacksilver Post second drop of water. 10 Soft Svartalfheim Steel 2500 Hacksilver Post second drop of water. 40,000 Hacksilver 1 Hardened Svartalfheim Steel Finish the Journey. 1 Hardened Svartalfheim Steel 10,000 Hacksilver Finish the Journey. 1 NiflheimAlloy Fragment 500 Mist Echoes After Niflheim. 1 Haze Weave 1000 Mist Echoes After Niflheim. 1 Aesirbane 2500 Mist Echoes After Niflheim. Mark of the Dwarves Runic +4 Received automatically. Yggdrasil’s Dew of Cooldown Cooldown +2 In Lake of Light in Alfheim. Yggdrasil’s Dew of Cooldown Cooldown +2 Northeast of Light Elf Outpost in Lake of Nine. Yggdrasil’s Dew of Defense Defense +2 Southwest of Muspelheim tower in Lake of nine. Yggdrasil’s Dew of Defense Defense +2 South of Ruins in Lake of Nine. Yggdrasil’s Dew of Luck Luck +2 Near Buri’s Storeroom in Lake of Nine. Yggdrasil’s Dew of Luck Luck +2 Behind Svartalfheim Tower in Lake of Nine. Yggdrasil’s Dew of Runic Runic +2 East side of Iron Cove in Lake of Nine. Yggdrasil’s Dew of Strength Strength +2 Near Alfheimrealm tower in Lake of Nine. Yggdrasil’s Dew of Strength Strength +2 Near the Cliffs of the Raven in Lake of Nine. Yggdrasil’s Dew of Strength Strength +2 East side of Nilfheim tower in Lake of Nine. Yggdrasil’s Dew of Vitality Vitality +2 Southeast side of Isle of Death in Lake of Nine. That is all we have for our God of War Materials Locations Guide. Let us know if we missed something using the comments section below!